Biking and hiking in Petoskey, Charlevoix and the whole Chain of Lakes region offers the chance to circle Torch Lake and pedal between picturesque lakeside towns. Hike through forested, marsh-laden natural areas teeming with wildlife, and turn your hike into a multi-day backpack adventure. Luckily there are plenty of inland lakes, and of course Big Blue, for cooling off after a summer day on the trail. For serious road warriors, your ticket to one of the best rides in the region is simply to follow the eastern shore of beautiful Torch Lake, which, at 19 miles, ranks as Michigan’s longest inland lake. The tree-lined route along East Torch Lake Drive offers relatively flat terrain and intermittent views of Torch’s tropical-blue waters. The shoulder is less than generous at times, but assertive riders shouldn’t have any problem with traffic, even during peak tourist season. 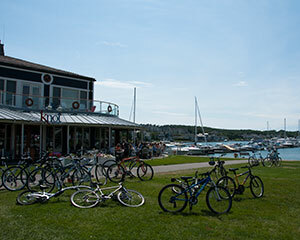 Our suggestion: Start your ride in the village of Alden on the southeast end of Torch, and bike 17 miles to Eastport at the top of the lake, where the beach at Barnes Park is a great place to spend the afternoon before heading back south. With nearly 26 miles of trails—almost all of them paved—the Little Traverse Wheelway (trailscouncil.org) makes exploring the region as easy as riding a bike. Not only does the trail allow you to pedal all the way from Charlevoix through Petoskey and onward to Harbor Springs, but most of the journey will put you within sight of the beautiful Lake Michigan coastline. On your trip you’ll find more than a half-dozen roadside parks to take in a picnic lunch, and numerous beaches with direct access to the water. Make Petoskey your midway point and you’ll have access to some of the region’s best restaurants and shopping. Find the Charlevoix trailhead, plus parking and restrooms, at Charlevoix Township Hall, 12491 Waller Road. For bike rentals nearby, try Revolution Bike & Boards. 102 MASON ST., CHARLEVOIX, 231.237.0900, REVOLUTIONBANDB.WEBS.COM. 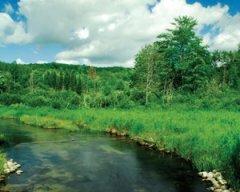 A 1,400-acre Antrim County oasis and self-proclaimed “eco-guardian project,” Grass River offers visitors a peek into the upland, wetland and aquatic ecosystems of the Chain of Lakes. Seven miles of easy walking trails meander along meadows, woods and streams; one section of trail includes a wheelchair-accessible “perception pathway” for visitors with special needs. The interpretive center offers lots of classes and guided hikes, such as the weekly 1 p.m. “Sunday Stroll”—a leisurely walk led by a naturalist. 6500 ALDEN HWY., BELLAIRE, 231.533.8576, GRASSRIVER.ORG. This rugged 18-mile trek winds through the wildly scenic Jordan River Valley, an 18,000-acre swath of state-owned forestland. The tract has dramatic elevation changes and is home to the pristine Jordan River. This is a great destination for a weekend backpacking trip; stay overnight at Piney Bridge Campground, a rustic camping spot with 15 hike-in tent sites located about halfway along the trail. For an easy day hike, try the three-mile Deadman’s Loop. Find the main trailhead off Deadman’s Hill Road, six miles north of Alba on US 131. State Recreation Passport required. 989.732.3541, MICHIGANDNR.COM. Many visitors overlook this pretty 1.4-mile hike, but it’s a treat worth seeking out. The 17-acre tract, tucked down a residential road near downtown Alden, encompasses a 140-foot ridge forested with virgin hardwoods. It’s the perfect spot to stretch your legs and search for wildflowers; come fall, the foliage is magnificent. From downtown Alden, follow Coy Street south for one-third of a mile; turn east on Valley Street. The preserve is two blocks in. VISITALDEN.COM. For more summer vacation ideas in Northern Michigan, grab the 2013 MyNorth Vacation Guide! From the same people who produce Traverse, Northern Michigan’s Magazine, this is a colorful, easy-to-use guide to Northern Michigan vacation ideas from Ludington to Traverse City, from Charlevoix to Mackinac Island and everything in between. It is filled with ideas, tips and hundreds of websites that connect you to fun, food, activities, lodging and recreation in every part of Northern Michigan. Buy the complete 2013 MyNorth Vacation Guide now! Be sure to also check out our free online area-specific vacation guides!